My god, rescues, please pull! this is a senior german shepherd, who had severe neglect and was abandoned outside to survive this past winter! 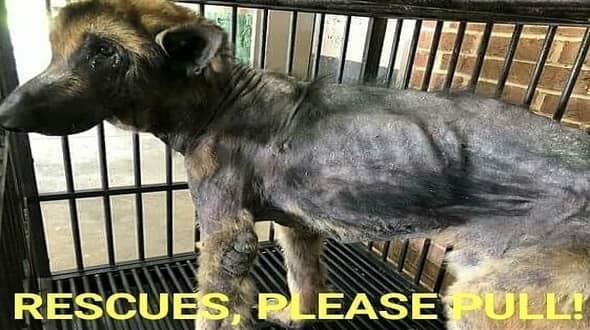 Please, please, a rescue must pull this dog. He is a male, grossly underweight with a skin infection. He needs the utmost kind treatment! 4 Responses to "No one wants this senior german shepherd , this boy has zero chance of making it out alive sadly"
This is incorrect information. My 501c3 rescue, Sasha's Hope, located in Jasper, Al has expressed interest. We are willing to pull him once released by the vet. I have a foster spot waiting on him. Thank you Rachel Waid...I will help with a donation when you get him! RESCUE UPDATE:: Sasha's Hope and Rescue, Inc. - He's still in the critical care unit at the clinic. They think he is only about FIVE years old. He's heartworm negative! Negative skin scrape. He's on doxycycline for nasal discharge. He's been vaccinated and dewormed. He only weighs 43 lbs but should weigh double that. We are in constant contact with his caregivers and have a good relationship with them. I'm holding a spot for him so he has a place to go!"